Pink Clouds Giveaway: I Love… Giveaways! Do you? 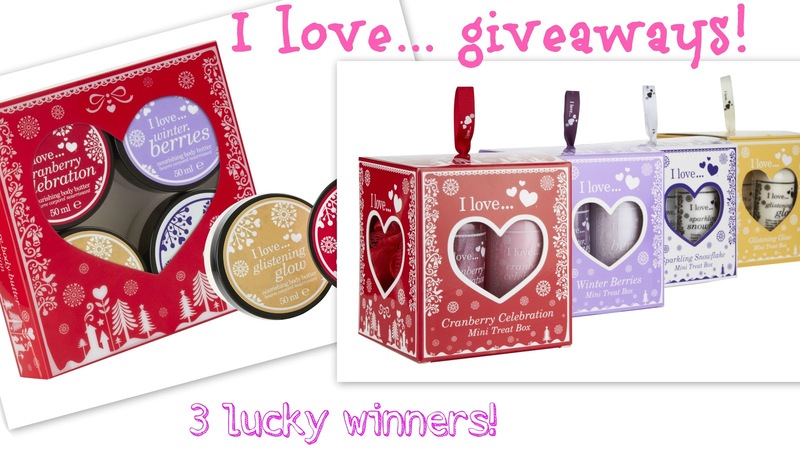 The wonderful Pink Clouds is doing a give-away to win one of the Christmas limited edition I love…Cosmetics gift sets. Want to be in a chance to enter? Then just click the image and it will take you to the blog entry explaining what you have to do. Around a year and a half ago I noticed that I was buying makeup just for the sake of it and then put it away in my makeup bag, I also entered a lot of competitions to win some makeup. Also around this time I had noticed the Project Pan 10 going round, which I tried but failed at because I was still buying makeup which made me think of doing something similar to Project Pan 10. A makeup buying ban. I am still doing this and havent bought any makeup since then. Annoyingly I have entered a few makeup competitions but luckily I didn’t win any of them (never thought I would say that!). I don’t wear makeup that often so this is probably why it is taking me so long to use them up, I have only managed to use up 2 items, which is annoying but at least I have gotten rid of something. I do have makeup palettes which I am ignoring for this challenge as I know they will take even longer to get rid off. To help me keep focused on this challenge I will be posting notes on here so I can keep on track. Around 6 years ago I went on holiday to Turkey with my then boyfriend, his mother and his friends who had just gotten married so this was their honeymoon. When we were there the female friend decided to go and get a tattoo, so we all went along with her. When we were sitting in the tattoo shop and saw it happening, I was very tempted to get one done. I waited a day just to make sure I really did want one and in the end I got my first tattoo. I don’t regret getting this tattoo and I hope I never will, I had turned 18 that year and I felt it was some sort of independence status. I thought it would be easier to split this up as there would have been a huge amount of photos for one blog and it may have made a few computers go nuts. Again I have not been able to use these fully so I am not going to be doing a review of them just yet, so these are just the swatches. Some of these palettes were limited edition so you may not be able to get them (unless you are lucky and can find them on eBay). The ones marked with a * are the ones that are still being sold on their website. Around 2 years ago Sleek Makeup had two competitions going on, one to win the full I-divine eyeshadow palettes (what they had at the time) and the other one to win all the pout polishes (again, the ones they had at the time). I was one of those lucky people to win both competitions. This is not going to be a review of them, that will probably come later on. As I haven’t really used them that much so I don’t think it would be fair for me to do a review, but I thought I would do some swatches of them. To be honest, I don’t own that much products for the face area as I am always nervous when applying anything to my face, my eyes and lips are fine, I pretty much know what I am doing with them two areas. It is just applying blush/bronzer, foundation, concealer etc.Which I am pretty much clueless about, although I have been learning more and understanding what is my right colour to use for foundation and concealer. I do have a few face products which I will show you. I did clean these honest I did! But it is easy for them to get messy all over again. These are the Natural Radiance Blusher, they feel like talc powder and go on very smoothly, the only problem with them is that they are too powdery (as you can see in the photo), they can get very messy easily, not on the face, once applied it looks very beautiful and you can build it up to achieve the right colour for your own taste which is brilliant. But it does get very messy when it is opened, when you put your brush in there, if you drop it, it tends to go like what it shown in the photo – Well that is what I have found. But for £1.50 I don’t think it is a waste of money at all. I had bought these back when they had only a few selection (the fair, light, medium), so I didn’t really know which colour would suit me the best – none suited me as when I received them they were too dark for my skin colour. But I still kept these, sometimes I use them just like primers for my eyes, or lips. Or even if and when I do get a little bit of a tan I could apply this in some areas, but I mainly use them for primers. The all over color stick is a bit thicker than the tone correcting concealer, sometimes I don’t like this product at all because it is too thick and sometimes makes me feel as if I am wearing loads of makeup, but other days I feel it is really good. I can’t really say anything about the tone correcting concealer as I have hardly worn it sadly, but the times I did wear it I was happy with the out come, over all I think I would choose the tone correcter over the all over stick. Although with the all over color stick you get to choose how much you apply to your face, which is a good thing. Maybe I could do a better review when I am able to get the right colour for my skin and understand it more better.. Both of these products are £1.50 each. These are so good if you want that tiny bit of makeup, but don’t want to look like you are wearing that much. They just seem to add that tiny bit of glow to either your cheeks, eyes or lips. The colour doesn’t show that well, but like some of the ELF products you can always build them up til you have the right amount of colour etc. They don’t feel sticky either when they are applied to your face, which is really good as well. The only problem I had with one of them was, that I turned it too far up and it wouldn’t go down and down it looks bad. It managed to go down when I put the lid on it, some of it stuck to the lid but as long as I got it back inside that was the main thing, so whatever you do, don’t do what I did and turn it all the way to the top until it clicks and you realise you have gone too far! Anyways, these are a very handy product to have. They cost £1.50 each. I mainly have lip products from their normal range (this range doesn’t really have a name so this is what I call it), as well as a lip product from their mineral range, all these are brilliant to wear. They don’t feel that heavy when applied, I also find that they are not that sticky so you don’t feel as if you have applied to move on. The smell of them I can put up with, they all smell really nice to me so I don’t have a problem with that – The Luscious Liquid Lipstick has a vanilla mint scent to it and the Super Glossy Lip Shine Spf 15 has a grape vanilla scent. And then you have the Therapeutic Conditioning Lip Balm, the scent of this lip balm is strawberry crème, they also have vanilla, orange crème and raspberry crème. Luscious Liquid Lipstick, Super Glossy Lip Shine Spf 15 and the Therapeutic Conditioning Lip Balm cost around £1.50 each and the mineral lipstick is £3.50 each. I also have the Lip Definer and Shaper which is pretty good for those who want to make out that lips are a bit more fuller than what they really are, if you don’t like the feel of a plumping lip gloss then this is probably a good thing to have. There are two ends to this product, the definer and then the shaper – on each side they have written which end is what and then the other side of the pencil has the colour written on. The pencil lip is also really good and useful, it has a sharpener on. The Lip Definer & Shaper costs £3.50. You cant see it that well, but I thought to add the swatch in just in case..